With one-off projects, WordPress agencies often struggle to maintain regular cash flow, but with recurring revenue from website support packages and long-term retainers, the feast or famine roller coaster can finally come to a halt. Running a WordPress agency isn’t or wimps for the faint of heart. The sales cycle can drag out for weeks or months and when you finally close the sale, the only money coming in is the initial deposit. You complete the work but clients take forever to respond or even disappear, which means you may not reach payment-related milestones in a predictable timeline. Just because you reach a project milestone and send an invoice, it doesn’t mean you’re guaranteed to get paid on time. Plus, the pressure that comes with constantly needing to close new sales can be incredibly daunting. If you’re anything like me, you’ve probably found yourself lying awake at night more than once because you’re stressed about cash flow. WordPress agencies can end the feast or famine cycle and solve cash flow challenges by not only selling one-off WordPress websites but long-term partnerships with monthly retainers and monthly website care and support packages. Today we’re going to look at selling monthly website support plans to create recurring revenue and stronger client relationships, as well as greater income stability and financial security. Monthly website support plans work like insurance: many pay in, all benefit, a few use it a lot. The tasks you need to perform are the same whether you’re doing them for one client or 100 clients. You can leverage tools like iThemes Sync allow you to manage multiple WordPress sites at one time, saving you time and increasing your profits. Your first support client will be your most expensive client — basically a break even between effort required and fee collected. Then as you sign more clients, economies of scale kick in and your effective hourly rate increases. This means that the more support clients you have, the better the profitability will be. Keeping clients’ sites performing without issue and better protecting them from malware, spyware, and hacking, which results in fewer panicky phone calls and urgent requests. Selling even a few monthly website support packages can lay the groundwork for amazing changes in your business. Plus, when selling support plans, you’re selling access to you and the value you deliver — and you’re setting the stage to upsell additional services in the future. Pricing your website support packages can be challenging. If you charge too much, you risk clients saying no and lose out on ongoing business. If you charge too little, you risk rate erosion and frustration from being on the hook for work you’re not being paid enough for, which leads to resentment, which isn’t good for you or your clients. When you sell hours and track your time in minute increments, you actually punish yourself for being good at what you do and effective with your time, which in turn erodes your profitability. Instead, you need to sell the value delivered. For an agency, these tasks aren’t a big deal. In fact, you can probably complete most of them in very little time. Your clients on the other hand, view these tasks as a very big deal. To your clients, they may seem too technical, too difficult, or too complex, and as a result, they have high value. This means that if your website support packages are structured around the value your clients perceive, you can charge a higher rate, which ensures your plans are profitable. Website support packages can be one of your highest margin service offerings, billing at your full hourly rate or even a higher rate when you factor in quantity. But before you even start to think about what a client might or might not pay for monthly website support, you need to understand how much money you need to make per client. How much time will it take you to perform support tasks for one client? Perform all of the tasks included in your website support plan(s), tracking the time required for each one. How much must you charge to earn your full rate for every hour required to deliver the work? This is the minimum amount you need to charge each month. What are my monthly expenses? Set a goal to cover your expenses with monthly support clients and retainer clients. Knowing your expenses are covered through support contracts will greatly reduce the stress that comes from constantly needing to close new sales of larger projects. Remember, your first website support client is basically a break-even between effort required and fee collected. Then as you sign more clients, economies of scale kick in and your effective hourly rate increases. Offering website support services generates dependable recurring revenue, builds stronger client relationships, provides much-needed breathing room, maximizes client value, establishes greater income stability, and creates more financial security. 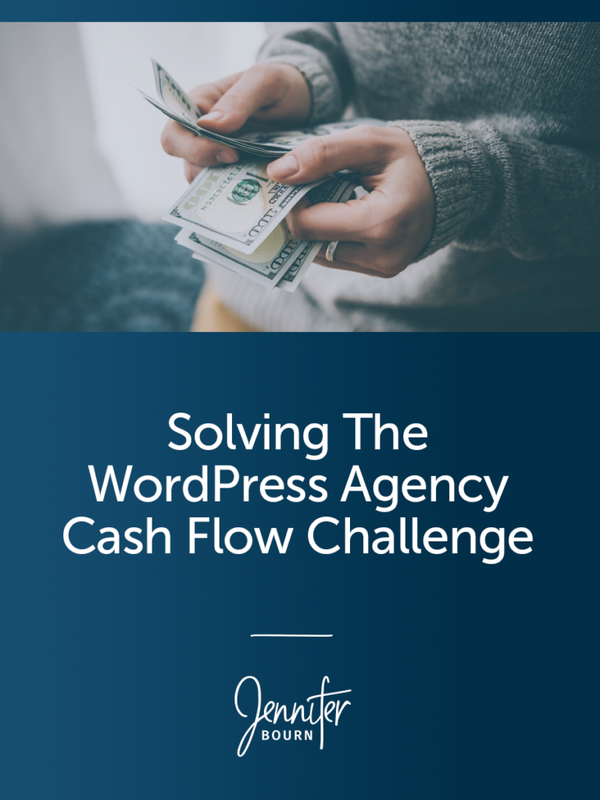 As the next logical step after website launch, it’s a natural add-on for WordPress website projects and a simple way to solve the WordPress agency cash flow challenge and increase your profit margin.